Happy Taco Tuesday friends! I've teamed up with another local food blogger, Megan Meisner, to create this new recipe. We’ve taken the classic frittata and turned it into a tasty taco-inspired dish! With a side of fresh salsa, this recipe is sure to satisfy your cravings while providing the vitamins, minerals and protein your body needs. "Megan Meisner Fitness emphasizes activity, nutrition and restoration. My online fitness program will help you silence the distractions and focus on mindfulness, self-awareness and support to reach your goals. the emphasis is on progression, NOT perfection." Megan is also a mom and a wife and enjoys cooking healthy, wholesome dishes as much as I do. So join us in cooking up something tasty this week, enjoy friends! Fritatta: Preheat oven to 475 degrees. Beat eggs, milk and seasonings in bowl. Add half of the cheese, peppers and onion. Mix well. Melt butter in six to eight-inch, nonstick skillet over medium heat. 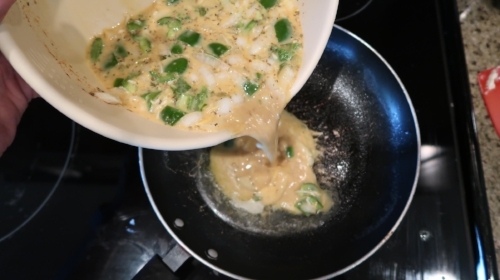 Pour in egg mixture and cook over low to medium heat for at least 10-12 minutes, until eggs are nearly set. Top with remaining cheese and place in oven until golden brown, or 10-12 minutes. Set broiler to high and cook for another 1-3 minutes. Watch closely to avoid burning the frittata. Salsa: Place all ingredients in a blender or food processor and mix. Top cooked frittata slice with salsa and shredded cheese.